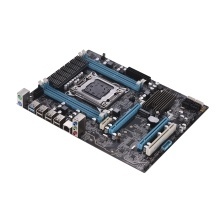 Support for 79/c60x chipset and for I7 E5- V1 E5- V2 serial LGA2011 processor, delivers great performance enchantment to system and ultimate scalability hardware expending. Support 1*PCI, 1*PCI-Ex1, 2*PCI Ex16 M. 2 slot, delivering a large leap forward in reducing latency and accelerating systems for workloads demanding large capacity and quick storage. Support DDR3 DIMMs channel memory, and support up to 64 GB large memory capacity. Adopt full solid capacitor, full closed-form inductance and a rigid power management module, ensuring strong power supply. Full solid capacitors provide a more stable power supply even under high temperatures ensure a longer service life and boost the ultimate performance. Short circuit protection, ESD protection—protect your motherboard from electrostatic damage, LAN surge protection—protect against LAN surges and lightning strikes and anti-high temperature. Please don&apos;t mind if the motherboard model or appearance is adjusted, as the product is constantly being optimized and updated, then we will not notice any more.